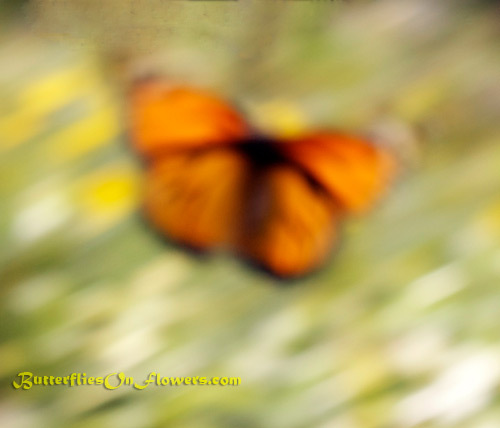 Caption: An in-motion Monarch Butterfly (Danaus Plexippus) racing through the butterfly garden looks more like an abstract painting than a butterfly picture. This photo was a complete accident. I was just about to start shooting my monarch subject when he/she abruptly decided it wasn't going to happen. I almost deleted the photo but decided to clean it up a bit with my photoshop skills...and I use the term "skills" lightly. I am pretty happy with the results, although I think someone with real photoshop skills could have made it look better. Butterfly facts: In January 2002, a rare ice storm hit the monarchs wintering grounds in Mexico. Two hundred million butterflies died during this tragic fluke of nature. The good news is, they've recovered nicely since, though numbers are still down due to increased destruction of their habitat(s).